SwRI's own David gave a nice invited talk on YORP, a thermal effect that changes the spins of small bodies. The YORP effect was confirmed for two Near-Earth Asteroids (NEAs) in 2007, resulting in fame, fortune, and papers in Nature and Science for two groups. YORP may be the main mechanism that forms binaries among the NEAs. 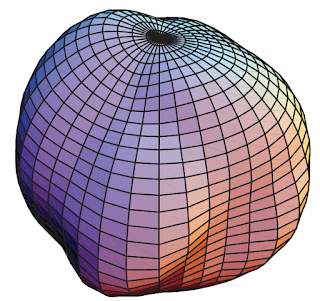 Most modeling of YORP has been done numerically, but David and David derived an expansion of the YORP torque in spherical harmonics that agrees well with numerical results for reasonably round bodies such as 1998 KY26. In the same session, Steve Chesley of JPL gave a talk describing his work with David on a clever approach to look for the Yarkovsky effect in NEAs by modeling it as a transverse acceleration (at), just as he does to model nongravitational forces in comets. The model value of at translates into a drift rate in semi-major axis, which is the key effect he's looking for. As I recall, he has tentative detections for over a dozen NEAs. It just goes to show how prescient I was a decade ago when I got a proposal to review on how Yarkovsky might affect the orbits of asteroids. Many years before, I had learned of the Yarkovsky effect in a course taught by Joe Burns while he was on sabbatical in Berkeley. I had Yarkovsky pigeonholed as one of those strange radiation effects like Poynting-Robertson that applies to dust and rocks, but certainly not to mountains in space. Now there's a veritable Yarkovsky industry. If you want to read all about it, here's a review paper by Bill Bottke and the Davids. As Bill likes to say, with two Davids we can Czech and re-Czech our results. This year's Division on Dynamical Astronomy meeting seems to have been a success. Now that the meeting is over, I'm going to free-associate about one talk each day. We'll see how far I get! From Kathryn's abstract: In the last decade, the stellar halos of the Milky Way and Andromeda galaxies have been mapped in exquisite detail, revealing that they are actually richly substructured in phase-space due to the presence of debris from tidally disrupted satellites. The Local Group consists of Andromeda, the Milky Way, and at least 33 smaller galaxies, which is appropriate since M33 is the largest of the nieces and nephews. As the eons pass, Andromeda and the Milky Way are engaging in galactic cannibalism, with the Clash of the Titans likely to occur in about 3 billion years. Until that large meal, we must subsist on snacks such as the Sagittarius stream. 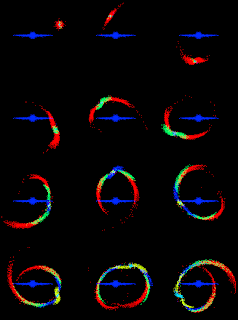 Streams are produced by tidal disruption of dwarf galaxies; similar tails are seen in simulations of the Moon-forming impact. The structure of the streams provides a sensitive probe of the Galactic potential at large distances. Ultimately, we will be able to compare aspects of the outer Galaxy, such as the shape of the halo, with that predicted by cosmological N-body simulations, some of which now follow over 1010 particles, i.e., more than one for every man, woman, and child on Earth. One of the key projects of NASA's planned Space Interferometry Mission telescope will be to determine Galactic structure out to hundreds of kiloparsecs, a region containing a number of tidal tails.